As dash cams become increasingly popular amongst drivers, bikers and cyclists, Hodgkinsons investigate the effects they may have on a Personal Injury Claim when acting as a source of video evidence. 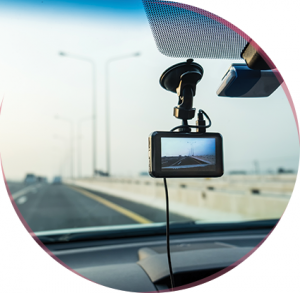 Initially a widespread trend in Russia, dash cameras have become popular not only in the UK but the rest of the world too and have increasingly become accepted as a form of evidence for road traffic accident claims including motorcycle accident claims. Proving that an accident was not your fault can often be difficult however the introduction of dash cams could help to prove who was at fault as they offer unbiased observations and evidence rather than both parties submitting very different accounts. Dash cams act in the way of CCTV and have proved useful to not only Personal Injury Solicitors but police forces and insurers as footage helps to prove who is at fault. Dash cams have also proved useful for the detection of insurance scams by capturing drivers who deliberately cause an accident in order to claim against the other parties’ insurance. The UK government have recently been asked to legislate front-facing cameras in an effort to reduce the number of ‘crash-for-cash’ incidents which cost the insurance industry millions and have become the cause for increased insurance premiums. These cameras can be worn by all types of motorists whether mounted on a drivers’ dashboard or window screen or on a bikers’ helmet, otherwise known as a helmet cam. The purpose of the camera is to capture everything which is happening on the driver’s journey, from their perspective. Varying models of the camera may offer additional services such as night vision, sound recording, location recording or the ability to detect impacts. The recorded footage will be captured and stored on the camera’s internal memory drive. If an accident was to occur, selective footage can be kept and transferred to a computer via a memory stick or email for review by a Personal Injury Solicitor. If you have been involved in an accident which was caused by another driver acting negligently, you may be able to claim road traffic accident compensation. However, to do so you must be able to prove that the collision was the other driver’s fault. The typical methods of proving this include witness statements, photographs of the accident scene and any damage sustained to the vehicles involved. Dash cams can now be used as an acceptable form of evidence as they can help to demonstrate how the event unfolded. It is known that dash cameras can reduce the long-winded process of piecing together both parties’ arguments, police reports, road measurements, vehicle damage and witness statements. Whilst they provide essential evidence which is particularly useful when there is a lack of witness evidence, they are not sufficient enough to be used on their own and therefore must be used in conjunction with these other types of evidence. Various other benefits of dash cameras include the ability to encourage insurers into admitting liability quicker alongside their effect on UK insurers who have started to offer customers a significant reduction of 10-15% on their insurance if customers install a dash cam. This reduction in insurance premiums is based on the fact that insurers will be able to determine which party was at fault quickly, saving them money alongside providing drivers with lower premiums and protection of any no-claims bonuses and excess penalties whilst encouraging responsible driving. If you have been the victim of a road traffic accident which was caused by another driver who was acting in a negligent nature, you may be entitled to road accident compensation. Contact Hodgkinsons Solicitors, Skegness, on 01754 897150 where a member of the Personal Injury Department can discuss your accident injury claim further. Alternatively, you can submit an online claim form and a member of the Team will call you.